Most gaming notebooks have a certain stigma attached to them. While some of the better systems available are more than capable of running the latest graphically demanding PC games out there, they're often hulking beasts that can easily tip the scales at over 12 pounds. Recently, however, gaming notebooks like the Razer Blade have helped steer the industry towards slimmer form factors. Case in point is the MSI GS70 Stealth Pro notebook we'll be looking at today, a descendant of the hefty GX60 we looked at early last year. MSI's GS line consists of portable gaming notebooks with a focus on performance and portability. They're generally very slim, very sleek and lightweight compared to the GT series, MSI's most powerful (and big and heavy) line. But don't be fooled, as the top-of-the-line GS70 Stealth Pro is packed with the sort of hardware that'll likely put most desktops to shame. The unit we tested came packed with an Intel Core i7-4700HQ processor clocked at 2.5GHz, paired with 16GB of DDR3 1,600MHz RAM and Nvidia's GeForce GTX 870M GPU with 6GB of GDDR5 memory. A 17.3-inch full HD anti-reflective display takes care of the visuals with a resolution of 1,920 x 1,080 but it's the storage system that may surprise most. One would expect a solid state drive to go along with this sort of configuration. Instead, MSI is using not two, but three 128GB solid state drives in a RAID 0 array for a blazing fast boot drive. There's also a 1TB hard drive spinning at 7,200RPM to handle storage duties. Other specifications include a Killer E2200 Gaming Network card, Intel Dual Band Wireless-AC 7260 and a backlit keyboard by SteelSeries. Our price as tested here today is $2,099.99. MSI describes the outer chassis of the GS70 Stealth Pro as brushed aluminum grey, although under the right lighting, it almost takes on a purplish tone. The two-tone outer lid features MSI's and the gaming series logos. The right side of the machine is home to a battery reset hole, dual USB 3.0 ports, an SD card reader, the power connector, a Kensington lock and ventilation slots. The back of the notebook is free of any connectors as the remaining I/O ports are found across the left edge. From back to front, we have an Ethernet jack, HDMI, two mini DisplayPorts, one powered and one standard USB 3.0 port, and headphone, SPDIF, mic audio jacks. A series of LEDs are positioned across the front left edge of the system. These are indicators for battery status, Wi-Fi, Bluetooth, caps lock, number lock, hard drive and sleep state. Opening the lid reveals the 17.3-inch anti-reflective, matte display. It's framed by a textured flat black plastic bezel that's a bit of an eyesore due to how thick it is, especially across the top and bottom where the 720p webcam with dual microphones and another MSI badge reside. The SteelSeries keyboard with number pad fills the area nicely without feeling cramped. It's slightly inset but more importantly, the keys are backlit in full color and can be programmed to your liking. A sound bar and the power button sit above it and a large touchpad below. A set of six rubberized feet on the bottom keep the system firmly planted on a flat surface. There's also a series of vents (one hiding a subwoofer that's part of the Dynaudio sound system), the obligatory stickers and multiple screws holding the back panel in place. With 16GB of memory and plenty of storage, there's really no reason you'd need to open things up for expansion purposes. This does, of course, meant that the battery is non-removable -- hence the aforementioned battery reset button. Pressing the button will initiate a battery reset, the same type you'd expect if you removed and reinserted a battery in any other notebook. The GS70 arrived with a 64-bit copy of Windows 8.1. As I typically do with a new system, I first headed over to the add / remove programs to gauge the amount of bloatware I'd be dealing with. In this case, there were half a dozen or so apps that I removed from the get-go including XSplit Gamecaster, MSI Social Media Collection, MSI Remind Manager and a trio of Norton programs. All graphics-based benchmarks (unless otherwise noted) were performed with the discrete Nvidia GPU selected as the recommended graphics card in the Nvidia control panel. As you can see above the GS70's GTX 870M GPU can handle modern games at 40 - 60 fps when using medium graphics settings in full HD resolution, but max out the eye candy and more often than not you won't be able to hit the 30 fps playability threshold. As long as you keep it reasonable you'll be able to enjoy most games on the market, which is great for a laptop this thin. The GS70 breezed through our informal YouTube 4k resolution video test without breaking a sweat. CPU usage never went higher than 10 percent and the clip never showed any lag. The iTunes encoding tests consist of converting 14 MP3s (119MB) to 128Kbps ACC files and measuring the operation's duration in seconds. The GS70 was done in just under a minute. For file transfers, we measure how long it takes to copy two sets of files from one location to another on the same drive. The small files test consists on transferring 557 MP3s, totaling 2.56GB, while in the large file the same MP3s were zipped into a single 2.52GB file. I conducted our standard notebook battery tests on the GS70. Our video playback test consists of looping a 720p rip of the movie Inception at full screen with max brightness and Wi-Fi disabled. This is a taxing test that resulted in just 1 hour and 18 minutes of battery life. These results were obtained with the graphics card set to "auto" meaning it selects either the integrated Intel graphics or the discrete Nvidia card based on what it thinks is best for the task at hand. The battery life was so poor that I ran the test again with integrated graphics selected but received the exact same results down to the minute. We were able to bring that up to 2 hours and 16 minutes, however, when toning down our test with 60% brightness. I was thoroughly impressed with the Dynaudio system as it was able to fill a large room with crystal clear music at only 50 percent volume. At 100 percent, tunes remained distortion-free but it was simply too loud for regular listening. Around 50-60 percent was the sweet spot for me. The speaker system is only one part of the equation as the Sound Blaster Cinema 2 software certainly helps things out. 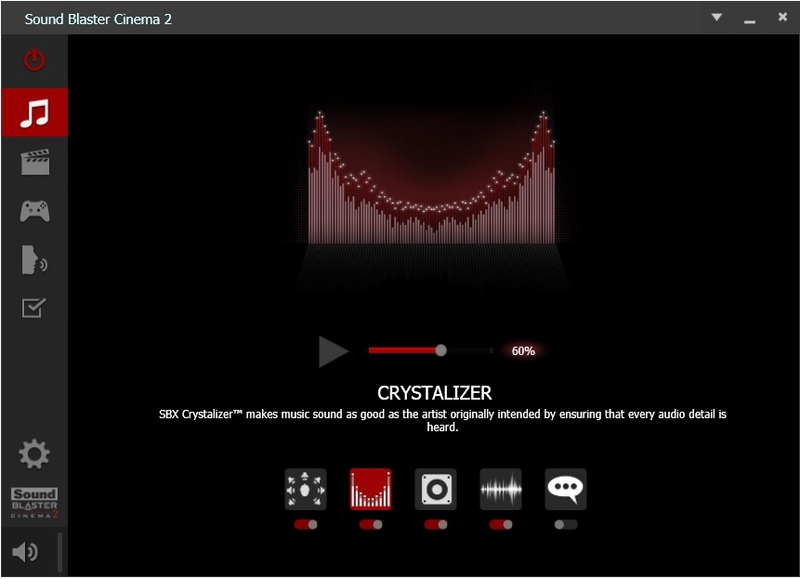 I've always been a fan of Sound Blaster's Crystalizer, a tool designed to "restore portions of audio lost during compression." Enabling it and adjusting the slider certainly makes music seem more "alive" which is the intended effect. Just to see how much of a difference the Sound Blaster software made, I disabled it and was instantly met with a flat and muddy experience. I'd certainly keep it running if given the option. Keeping expectations in check, I'd rate the speaker system as one of the best I've heard on a mobile platform. That's important on a gaming machine although I suspect most will prefer having a set of quality headphones handy for extended gaming sessions. It goes without saying that the storage system in this machine is incredibly fast, easily outperforming the dual SSD RAID 0 setup found in the Acer Aspire S5. With that speed, however, also comes the risk that in its RAID 0 configuration if any one of the three drives fail, you will lose everything. This is somewhat offset by the fact that you also have a terabyte drive available for storage -- and offsite cloud backups are getting ever more affordable as well. In any case, I personally like the idea of exchanging risk for speed as I'd keep mission-critical data backed up at all times but I can't speak for everyone. MSI has done a great job with the display on the GS70. Electing to go with a matte finish over a glossy panel will no doubt appeal to gamers as it virtually eliminates reflections under bright lights. Side-to-side viewing angles are superb but there is a bit of color shifting present when looking at the screen from above or below. That shouldn't be much of an issue, however, as one could simply tilt the screen for optimal viewing. The GS70 can get pretty loud during intense gaming action. As for heat output, the fan on the left side of the system seemed to expel much more heat than the right. Even still, the top area of the notebook just below the left bottom corner of the display got extremely hot -- far too hot to even hold a finger on for more than an instant. The system also heats up just as much on the underside which is likely why MSI covered the upper half of the base with a felt-like material. Without it (I touched a few of the exposed areas), it'd be far too hot to sit in one's lap. That said, I still wouldn't feel too comfortable using the GS70 in my lap while gaming. Find a nice desk or a similar flat surface that gives the machine plenty of breathing room and you're good to go. Fortunately, the keyboard area and the palm rest don't get very warm at all. The touchpad on the GS70 is one of the very few faults I could find with the machine. I would describe its operation as finicky at best. On several occasions, it would completely fail to recognize finger swipes. And not just once; I'm talking four or five swipes before the touchpad would register an input and move the mouse. Not to sound as though I'm making excuses, but again, I suspect most serious gamers will use a quality gaming mouse anyway. The touchpad is still very annoying to deal with during normal use but given the system's target audience, I don't think it'll be a major issue for most. The SteelSeries keyboard, meanwhile, worked great. I'll admit that the font used on the keys is a bit different but that doesn't actually impact performance. The keyboard as a whole did exhibit a bit of flex during use but again, it's far from a deal-breaker. I had no problems as it relates to accuracy when typing as there was plenty of real estate so I never felt cramped. The backlit keyboard is another solid addition to the GS70. I especially like the fact that the characters on each key are transparent and let light shine through. Most "backlit" keyboards only illuminate the edges of the keycaps which pretty much defeats the purpose entirely. There's plenty of customization available with backlight coloring and macros within the SteelSeries software. There's even a feature that'll record how often you press each key. I'm not entirely sure why such information would be useful, but it's pretty neat nevertheless. With four USB 3.0 ports, HDMI and two mini DisplayPort connections, this system is more than capable of handing a multiple input accessories, an external drive or two and some larger monitors. MSI certainly did a nice job here. If you're serious about spending $2,100 on a notebook computer, odds are that you're either looking for a desktop replacement or something that will handle real gaming without breaking your back while on the go. As evident by our benchmark results, you may not always be able to run every single game with every bit of eye candy on but you can get pretty darn close, and that's saying something for a laptop that's just 0.85 inches thick. The MSI GS70 Stealth Pro isn't without fault - namely a flaky touchpad and poor battery life - but if you can overlook these few glaring issues and value a lean footprint, this system is more than capable of meeting the needs of pretty much anyone. Pros: Vibrant display with a matte finish to eliminate reflections under bright lights. Blazing fast SSDs. Keyboard with configurable backlighting is a nice addition. Solid gaming performance in a portable and elegant package. Cons: Touchpad operation is rather finicky when it comes to registering gestures or even swipes. Battery life was another weak point, although that's to be expected for a machine of its kind.